A webpage on the North Carolina Campus Compact website presents an overview of the deliberative dialogue work the group has done, and new projects in the works. 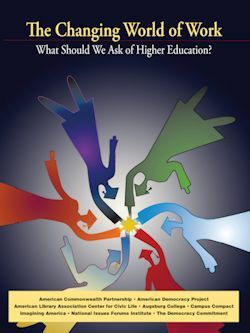 The page presents an overview of the meaning of deliberative dialogue; a brief history of deliberative forums since 2013, including training sessions for people interested in learning how to serve as moderators for deliberative dialogues; and a description of a current project promoting use of a new issue guide about higher education, The Changing World of Work: What Should We Ask of Higher Education? from the Kettering Foundation and the National Issues Forums Institute (NIFI). The webpage also includes links to resources including, Suggested Moderator Format, Tips for Moderators, Tips for Recorders, and Ground Rules; articles related to the Changing World of Work issue guide, and several websites with information about dialogue. Find more information about the Changing World of Work national deliberation project, and about how to participate, at https://www.nifi.org/en/groups/watch-changing-world-work.